I am passionate about restoring hope through movement. My goal is to help people find the root cause of their pain rather than just treating their symptoms. I enjoy partnering with each individual and working as a team in order to best address personal goals. My hope is that each patient will be able to return to the recreational activities they love. Education is key, so I strive to provide a level of knowledge that allows for everyone to be as independent as possible. Not only do we hope to address current issues, but we also want to prevent future injuries as well. I’ve found that each patient has something to teach me, too, and as a lifelong learner, that is something I truly value. I earned my Bachelor of Science degree in Health and Human Physiology, and Doctor of Physical Therapy degree from the University of Iowa. I am a member of the American Physical Therapy Association. I am also certified in Astym, and LSVT BIG. LSVT BIG is a specialized program to improve function in people with Parkinson’s Disease. When I’m not at work, I enjoy spending time with family, running and biking. 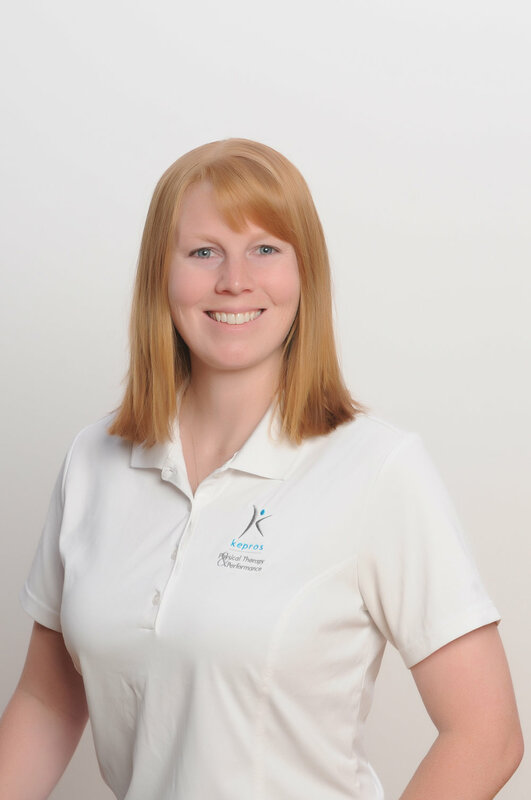 I’ve been going to Kepros for the past couple of weeks to work on some tendinitis. The therapists I’ve seen have been great about pushing me and encouraging my athletic goals while making sure I’m taking care of my injury.